In the navy: Vibe 03 style features our navy gradient tint lens in matte silver metal frame with temple tips and nose pads in matte black rubber. Perforated navy leather side inlays complete this elevated and sporty look. 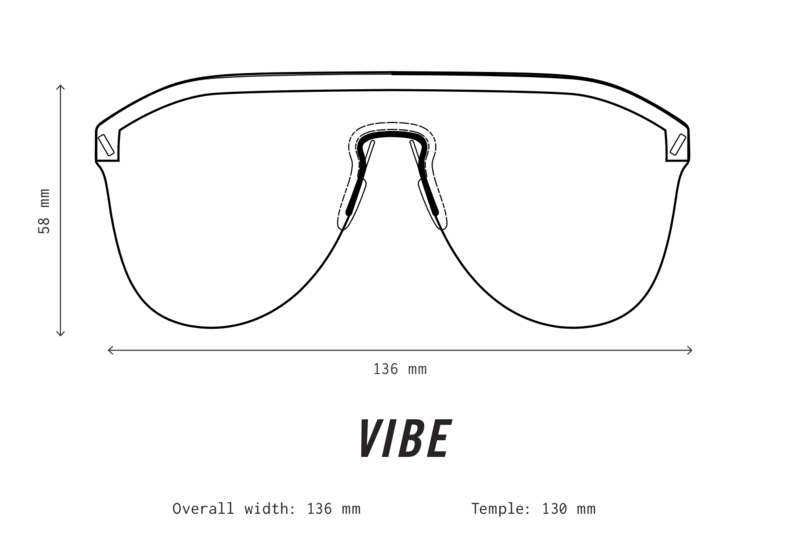 Good vibes only: Vibe frames feature an oversized one-piece shield lens in shatterproof nylon with 100% UV protection. Its specially designed nose pads prevent this large frame from sitting on your cheeks (and are easily removable for adjusting fit). The lens features anti-scratch, anti-sweat (hydrophobic), fingerprint-resistant (oleophobic), and backside anti-reflective coatings. The lightweight frame is constructed of surgical-grade stainless steel, with the smoothest, most durable hinges on the market. All touch points (nose pads, temple tips) are soft touch for comfort, and highly adjustable for the perfect fit.